After Emperor Shomu heard of the tragedy that Ono no Mayumi Takeyumi was hit to deth by the stray arrow, he ordered the Buddhist high priest Gyoki to build Chokyuji Temple to pray for the diseased. 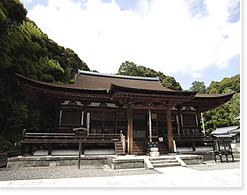 The main hall is built with typical late Kamakura period style temple construction and is the only National Treasure Building in Ikoma City. This temple is dedicated to wodden statue of Eleven-faced Kannon Bodhisattva (Juuichimen Kannonbosatsu) which is important cultural property together with a Buddhist altar cabinet (zushi) painted with black Japanese lacquer. Within Chokyuji Temple, at Hokkein, Yakushiin and Enshoin, with prior reservation, you can enjoy vegetarian cuisine in a peaceful quiet environment. From May to June, hydrangeas are in full bloom. On the Kintetsu Nara Line, from Tomio Station, take the bus bound for Hoji and get off at Mayumibashi stop.